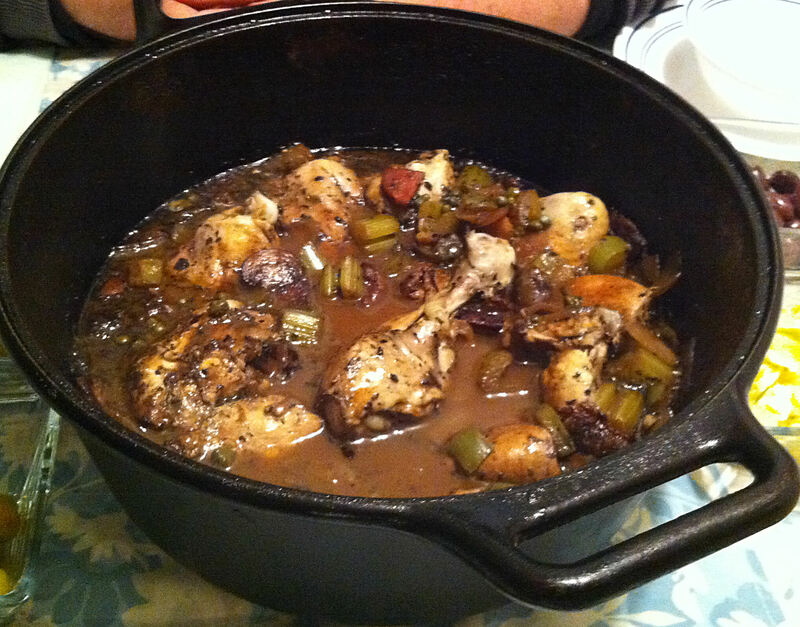 Many European countries have some variation of hunter’s chicken: the Italian pollo alla cacciatore, the French poulet chasseur and coq au vin, and the German hühnchen nach jägerart. The general idea of this dish is that you make it with the ingredients that a hunter would have on hand while out in the woods. Many modern versions include tomatoes and are served over pasta. In creating my Wise Sage Stew I tried to limit myself to what a what a trekker would actually have on the road. Tomatoes and dried pasta do not travel all that well, so I think an Italian hunter would not be carrying them on a hunt—as well as the fact that tomatoes are an historically fairly recent addition to Italian cuisine. Many hunter’s chicken recipes call for a second meat. I do not think that bacon—another frequent addition to this dish—quite fits the bill. While a hunter might carry some prosciutto, it is more likely that he would have a dry salami on hand—something that could be a meal in itself. I could see a hunter carrying a few sturdy vegetables to add to the pot, if he was planning to have a meal in the woods. An onion, some garlic. a stalk or two of celery, a bell pepper, these are all sturdy, light and transportable. Dried herbs are also easy to carry and add a lot to a rustic dish. What Italian hunter would be without a bottle of wine? So that is a gi’me. The Balsamic vinegar and capers may be a bit of a stretch, but I decided I wanted to add these ingredients as well. One problem with any simmered chicken dish is the skin. It always turns out flabby and unappetizing. Many recipes have you sear the chicken pieces—to try and get some of the flavorful goodness of well browned chicken skin. This leaves you with a pile of hot, half-cooked chicken. However, you still end up having to peel the skin off of each piece of chicken and discard it. In the latest Cook’s Illustrated, there was a recipe for Coq au Riesling—a variation of this dish. Their inventive solution was to remove the skin entirely and then to brown it well separately. Cooking the browned skin in the simmering sauce gives you all the well developed flavors of the caramelized skin, but it is easy to fish out and discard when you are ready to serve. Note: To go with my hunter’s chicken, I am making fresh rustic Italian bread and steamed artichokes. After Dinner Note: The chicken turned out tender and flavorful. The sauce for this dish was fantastic and just the thing to be sopped up with the rustic Italian bread. Jan requested that I repeat this dish when the “aunties” come next week for Stitches. 1. Peel the skin from the chicken and sprinkle it lightly with salt. Set it aside to dry. 2. Cut the chicken into bone-in portions. Note: There are many ways to cut up a chicken. I remove the back bone and ribs and save them for stock. I cut off the wings, so that each has a good bit of breast meat. For large breasts, I cut the rest of the breasts into three pieces each—I have a lot of diners who prefer white meat. If the thighs are large, I also cut them in half, when I separate the leg. 3. Cut the salami into eighth inch slices and cut the slices into quarters. 4. Add two tablespoons of olive oil to a large Dutch oven and brown the chicken skin well over medium high heat, 5-8 minutes. Tip: The chicken skin will render out a lot of grease into the pot. How much you used of this will depend upon your diet. If you desire you my remove it all and use olive oil for the sautéing. 5, Remove the skin to a plate and add the salami. 6. Sauté the salami for two minutes, until starting to crisp. 7. Remove the salami to the plate. 8. Spoon out all but two tablespoons of the grease. Tip: Reserve two tablespoons of the excess grease for later. 9. Sauté the mushrooms until well browned, about 6 minutes, and remove them to the plate. 10. Return the two tablespoons of chicken grease to the pot and sauté the onions, with the rest of the salt, until starting to pick up some color, about 6 minutes. 11. Add the celery to the onions and continue sautéing until the celery has turned soft, about five more minutes. 12. Add the bell peppers and continue sautéing for two minutes more. 13. Pull the vegetables to the sides of the pot and add the garlic to the hole in the center. 14. Sauté the garlic until fragrant, about one more minute, and add the herbs and pepper to the pot. 15. Mix the vegetables into the garlic and herbs and deglaze the bottom of the pot with the wine. 16. Return the chicken skin, salami and mushrooms to the pot and stir in the vinegar and capers. 17. Nestle the chicken pieces into the sauce and vegetables. Tip: You will be tempted to add some water, or more wine, to cover the chicken pieces. Do not do this. This chicken pieces will shrink and release enough liquid to do the job. Any additional liquid will only thin out the sauce. 18. Bring the pot to a boil and cover the pot. 19. Reduce the heat to low and simmer, undisturbed, for one hour. 20. Remove the pot from the heat and let it stand for 10 minutes to cool slightly. 21. Bring the pot covered to the table and lift the cover to fill the room with the stew’s fragrance. Tip: As you are serving, discard any pieces of skin. 22, Serve with fresh bread on the side.